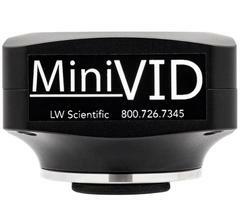 The MiniVID USB is our best-selling camera for microscopy. It can be mounted to nearly any brand or type of microscope, either into the eye-tube of a binocular microscope, or thread-mounted onto any trinocular C-mount. The MiniVID USB 3.0 is the perfect addition to any microscope for training techs, educating clients, or documenting for patient files and medical device records. Very fast frame rate for fast-action digital video. Works on any MAC or PC computer with USB3.0 port.